The Home of Christian Compassion Ministries and Covenant Stones, Inc.
John and Jane have been married over 35 years and have raised three grown sons. Pictured from the right: Matthew, Captain USAF rtr. 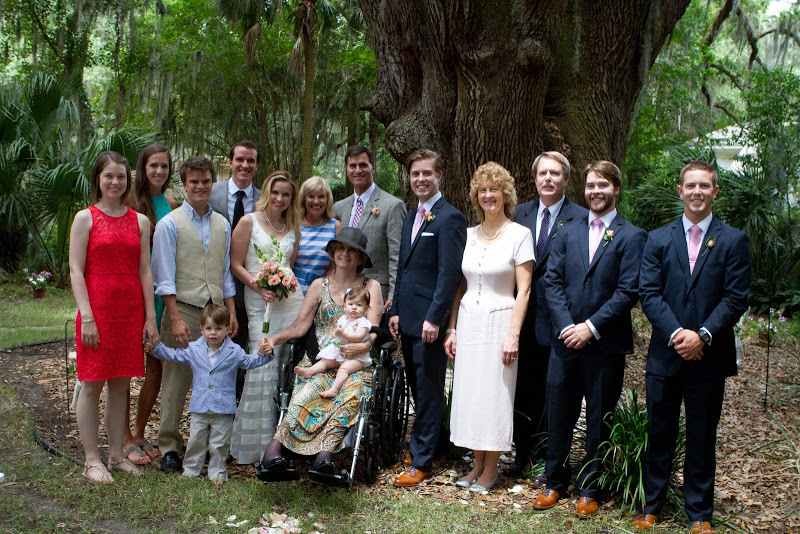 Meteorologist, next is David who is presently writing a Thesis towards Master’s Degree in Mechanical Engineering at FSU; John, minister and diamond broker; wife Jane who recently retired from Fletcher High School, son Daniel, full-time consultant with NCR, and Dan's wife Virginia (holding bouquet) surrounded by her dad, mom, grandma, brothers, their wives & children. Virginia is a board certified Psychiatrist and recent graduate of Emory University. John and Jane reside in the Beaches area located in N.E. Florida. “Chaplain John”, as he is often called, has a diverse spiritual and educational background. John was reared as a Catholic in St. Matthew’s Parish. After his Catholic mother passed from cancer while he was 10 years old, John was introduced to the Protestant faith while attending Jacksonville Episcopal High School; his interest in God was clear as he won the award for “Academic Excellence in Religious Studies”. After graduation, John attended Berry College where he had a profound life changing “born again” and subsequent "infilling of the Holy Spirit" spiritual experience in January 1979; this unique event has been the foundation of his life and ministry. John joined a Maranatha Campus Ministry at Berry College and two years later transferred to Florida State University to found and preside over a new chapter of Maranatha Ministries, a full gospel outreach geared to reach college age students on their campus. FSU Coach Bobby Bowden allowed John and others to preach and show films to the football players in their compound and many of those players made of a sincere commitment to Jesus! After earning his B.A. Degree at FSU, John decided to attend formal Seminary. In 1983 he entered Columbia International University in S.C. where he met Jane from South Africa who was studying in their undergraduate program at Columbia Bible College; John and Jane soon realized they were meant for each other, were engaged about two days later, and married in Johannesburg, R.S.A. about six months later. After Jane graduated with her B.S. Degree, they transferred to the Assembly of God Theological Seminary in Missouri to understand the Pentecostal / Full-Gospel perspective; John earned his Masters of Arts Degree and the couple returned to Jacksonville, Florida to seek the Lord’s direction. John and Jane initially considered mission work in Nigeria with a large Ministry, “Christ for All Nations”, but after investing many months of time, energy and money in that pursuit, the Nigerian Consulate simply refused to grant a VISA. At that point, John recognized that the Nigerian endeavor was an “Abraham/Isaac” test (meaning God wanted to see if they were willing to sacrifice their lives for Jesus as this area was known as the “Missionary Graveyard” due to rampant disease, poor infrastructure & intense Muslim persecution). The scripture about “widows in their distress” led John to begin ministering as a volunteer Chaplain in Avante Nursing Home in Jacksonville Beach; this is where Christian Compassion Ministries was born. Their Pastor wanted to financially support this “home mission” so advised them to apply to become a non-profit organization. A year later in 1994, this outreach became an IRS approved 501 (c) 3 non–profit religious organization. Five years later, Christian Compassion Ministries, Inc. (CCM) expanded into ministering in various Assisted Living Facilities. John regularly ministers to eight different congregations located in several different facilities such as Cypress Village, Ashford Court, The Windsor, Pablo Towers and Pablo Hamlet. Jane accompanies him when available. John’s mother died of cancer at age forty when he was only 10 years old. His mom suffered from the physicians and only got worse until she died. John was also diagnosed with hundreds of carcinomas at age forty, but took a very different route; John asked the Lord to heal him and NOT to have any medical treatment other than CT scans which confirmed hundreds of carcinomas in his chest. The doctors recommended starting radiation and chemotherapy but John said "no" . Without fear of the CT scan results, John simply requested prayer and a beleiver prayed for healing by laying on of hands. John felt a tangible “heat” that others have said they also felt when John prays for them. Many people who feel heat when receiving prayer actually get healed and John was excited to feel that sensation! After John’s next CT scan, all the tumors inexplicably shrunk and a few months later, the next CT scan revealed that all of those carcinomas simply vanished and NO medication of any sort was ever administered! John's Physician, Samuel Fern D. O., of Baptist Primary Care, wrote the following on his letterhead : “My patient John Dawson had a previous history of lung granuloma diagnosed in 2000. After a series of CT Scans were completed in that same year, he was shown to be cleared and free of disease“. John and Jane have prayed over their sons and have seen miracles (missing teeth appearing, bones mending on the way to the hospital, etc.). 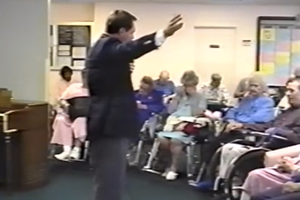 The Dawsons have seen incredible miracles in the nursing home with friends and neighbors and whomever is willing to accept that Jesus WANTS to help! Of course they still believe in going to the doctor and taking medicine, but at times the Lord just offers to cure for free! John also visit hospitals, rehabilitation centers, and personal homes. He is also “on call” to almost anywhere including middle of the night emergencies. One of their chief missions is to reach the elderly with the Gospel before they pass on and encourage everyone to build upon their relationship with the Lord. The Dawsons minister that Jesus desires a personal relationship with His people rather than going through the motions of a form of religion. Fortunately, this mission has been successful and the Dawsons are able to bless a person’s passing with an “End of Life Celebration”. They often conduct a Memorial Service and/or Funeral of a member of one of their congregations upon death. Chaplain Dawson has been heavily involved in serving on the Citywide Seniors Steering Committee for the Jacksonville Billy Graham Crusade, as well as the Executive Committee and Coordinator of the first March for Jesus. Chaplain John with his wife Jane have been increasingly asked to provide marriage counseling as their 35+ year marriage, along with the success of raising three children, has become a “neon sign” to people looking for proven and sound counsel! has been serving our senior community in nursing homes, assisted living facilities and other elderly care housing for over 25 years. We desire to continue this outreach to our residents and are often asked to serve in additional facilities. We ask for God's perfect will, your prayers and any involvement that the Lord leads you to offer to make this happen! has provided personal diamond and jewelry services since 1994. Without overhead costs typically associated with retail stores we are able to make top quality jewelry available at competitive prices. As a result, we do not advertise or deal with the general public choosing rather to work exclusively through referrals from past clients, their families or friends.